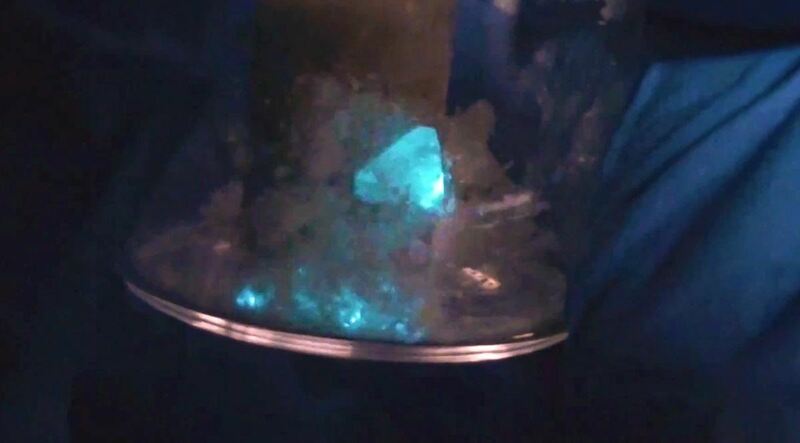 If you're a Breaking Bad junkie who can't wait for the next episode, satisfy your craving with a little at-home chemistry and make some blue DIY smash-glow crystals! No, this is not Walter White's so-called "Big Sky" or even the subpar cringe-worthy product of his competitors. It's not even the same kind of crystals, otherwise you wouldn't be reading this. This is totally legal, even kid-friendly if you play it safe, though it actually requires more safety precautions than the potassium nitrate crystals I proudly (due to my lack of chemistry skills) made myself a few months back. The proper scientific name for these crystals is something I can't even pronounce, so let's just stick to their nickname—smash-glow crystals—or just blue triboluminescence. Or you can let YouTube's favorite chemist, NurdRage, give you a lesson on chemistry pronunciations. Below, he demonstrates how to make these blue-colored smash crystals. Under ultraviolet light, the crystals will give off a blue fluorescence glow, which will also appear in visible light when smashed. Basically, to make these fun crystals, shake up the first three ingredients in your glass vial on the hotplate, until dissolved. To take the words right out of NurdRage 's mouth: "What we're making is a coordination complex with copper in the center, surrounded by two pyridines, a triphenylphosphine, and a thiocyanate ligand." Once everything is dissolved, turn off the heat and let it dry for a day or two for crystallization, but don't let it completely dry out. Wait until most of the pyridine is evaporated onto the walls of the glass, above the crystals, but not touching them. Use a pipette to remove all of the dirty pyridine, then wash the crystals a few times with toluene until clean. Then remove the toluene and let crystals dry. This gives you your blue smash-glow crystals! Even if you're not going to try this—which I suggest you don't—it's a fun video to learn from. If you want to see how to make the red smash crystals pictured above, check out NurdRage's previous video on that. 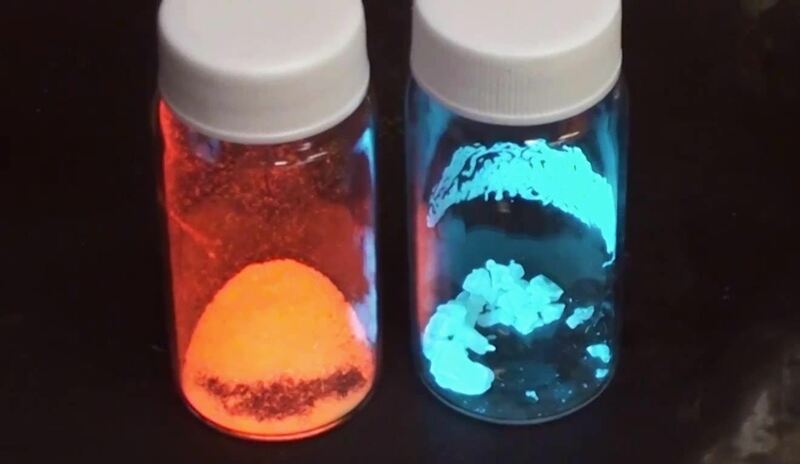 The ingredients are a little different, but you get the same smashing triboluminescent effect. Sure they are cool. But pyridine is some god awful stinking stuff. Like really stinks... maybe not quite as bad as a three day old corpse in a house with no air conditioning in july, but pretty darn bad. And triphenylphosphine doesn't exactly grow on trees... a non-corporate affiliated individual would probably not be able to aquire that. not only it stinks but is pretty much toxic also! Quartz and sugar are also tribo, but less toxic, the easiest being sugar table in big crystal.